This story was originally published by First Languages Australia  in Warra: Building teams, building resources . 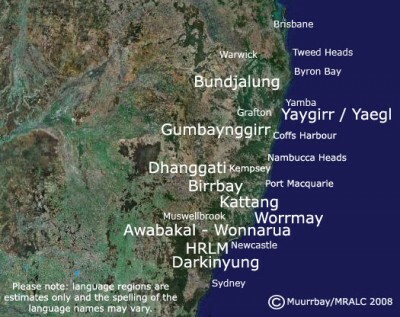 The Gumbaynggirr language  is traditionally spoken in the northern coastal region of the state of Australia now known as New South Wales (NSW). People across the region can hear the language, simply by tuning into ABC's Coffs Coast morning radio show. Each Wednesday, Gary Williams , a Gumbaynggirr language teacher at the Muurrbay Aboriginal Language and Culture Co-operative , a regional language centre working to support the languages of seven Aboriginal communities in NSW, teaches words and phrases to listeners and to the show's presenter Fiona Poole . The 3-minute segment airs at 7:30 am after the news broadcast. For those unable to tune in each week, the new words and phrases are also made available online on the ABC local blog . The blog links to audio of Williams saying the phrase and its translation. For those wanting the full three-minute version, one has to tune in to the radio show, as the blog shares just a short clip from the show. The language isn't just being taught on the radio. Though there are pockets of people who have grown up with the language, Gumbaynggirr lessons are also given in schools and community programs by dedicated teachers such as Michael Jarret, whose hope for his language are documented in the ABC OPEN  film posted above. The radio collaboration has proven to be an excellent way to promote Gumbaynggir and the work of the Muurrbay Aboriginal Language and Culture Co-operative  across the region both to radio listeners and internet users.